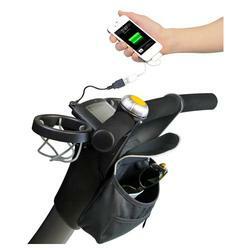 Keep your cell phone, keys, and other personal items within easy reach in our three-pocket, detachable handlebar bag. As you push the Origami, it recharges itself with power to spare. Put that power to work charging your cell phone or any USB-compatible device.